Congratulations on your retirement, Pamela Skinner! Emergency department secretary Jennifer Johnson, emergency department staff specialist Dr Daya Jeganathan, emergency department specialist Dr Kavita Vashney, Western Sydney Local Health District chief executive Danny O’Connor, emergency department clerk, Pamela Skinner, emergency department clerical manager Jenny Hart, emergency department clerk, Dr Anna Salah, emergency department registrar, Dr Michael Haddock, emergency department registrar, Megan Greig. 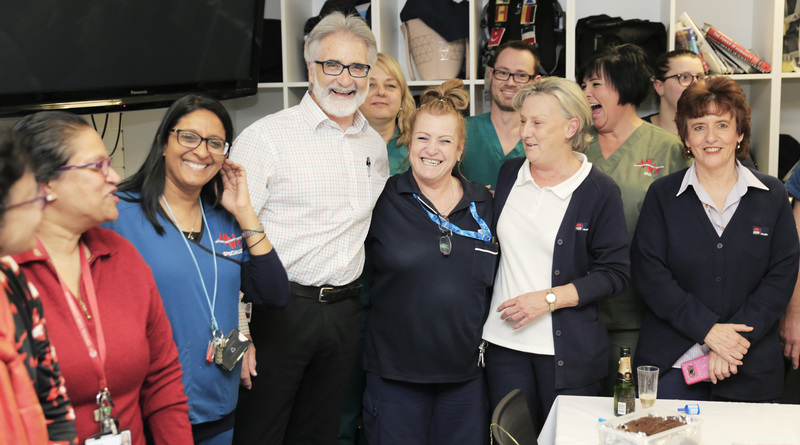 After almost four decades our much loved employee Pamela Skinner has retired from working at Westmead Hospital. For the first seven months of Pamela’s career in health she started as a cleaner. From domestic services she moved to food services where she worked for the next five years delivering meals to patients on the ward. The next 19 years of her life was with dietetics as a diet aide. This involved going up to the wards, handing out menus and of course talking to patients. She held various other roles across three campuses during her time but in the year 2000 she made her way to the Westmead Hospital emergency department. “You are always the first to offer a kind word or helping hand if needed,” Westmead Emergency department clerical manager Jenny Hart said.